18+. New Customers Only. Min £20 deposit. Max bonus £500. 20x (deposit + bonus) wagering reqs apply. Contributions to wagering reqs vary by game. Bonus valid for 30 days (bonus + winnings removed). Certain games and payment methods excluded. Bets covering 67% or more of Roulette table don’t count to wagering. T&Cs apply. New players at Ladbrokes casino are eligible to claim FOUR separate sign-up bonus options. The first three are £500 deposit bonuses, which are taken in sequence on each of your first three deposits, up to a maximum sign-up bonus package of £1,500. NB 18+. New Customers Only. Min £20 deposit. Max bonus £500. 20x (deposit + bonus) wagering reqs apply. Contributions to wagering reqs vary by game. Bonus valid for 30 days (bonus + winnings removed). Certain games and payment methods excluded. Bets covering 67% or more of Roulette table don’t count to wagering. T&C's apply. Bonuses issued in the Ladbrokes Casino tab, may not be used in conjunction with other promotions. In addition, bonus and promotional offers may only be used once and are not transferable or assignable. If you do not wish to receive bonuses from Ladbrokes Casino, please contact our customer service department by sending an email. Bonuses are only available to customers who make a deposit/transfer/allocate funds for it. Only one bonus is awarded per person, household, shared computer or shared IP address, unless stated otherwise in the promotion offer. The Wagering Requirements for all bonuses must be met within (30) days of your bonus becoming active otherwise the bonus + winnings will be removed, unless stated otherwise in the supplemental Terms & Conditions. If you have yet to complete the wagering requirements of a bonus whilst having claimed for another bonus/es, you must be aware that you must complete the wagering requirements of the first bonus before starting to accumulate the wagering for any consecutive bonus/es. Please note that until your combined total balance (allocated funds + bonus amount) between your active bonus and any other pending bonus/es reaches less than £1, you will still be tied into the wagering requirements for any claimed bonus/es in your account. Bonuses issued at Ladbrokes Casino will be reserved for gameplay on this product, including Slots and Live Casino, and cannot be used for gameplay on any other Ladbrokes products. PLEASE NOTE that upon accepting a bonus, you agree that the funds that have been allocated to the bonus and the bonus amount itself are subject to the wagering requirements which you will find in the Promotion and General Bonus Terms and Conditions. Any attempt to withdraw/transfer (including transfers to other products) any funds in your account; including any cash balance which is NOT attached to the bonus, prior to having met the full wagering requirements, will result in you forfeiting this bonus and any other bonus/es that may be pending in your account at the time, including any winnings which may have been generated from these. FREE SPIN bonuses are available on instant play and download version only (not Mobile). The extra spins have no Wagering requirements unless stated otherwise in supplemental Terms and Conditions. Customers with pending withdrawals will not be eligible to claim bonuses. The Wagering Requirements for any bonus are as follows - you must wager at least twenty times (x20) your allocated funds plus your bonus amount, unless explicitly stated otherwise in the relevant supplemental Terms and Conditions. For example, if you allocate £100 and receive a bonus worth £100, you will be required to wager (£100 + £100) x 20 = £4000. Not all bets will count towards the wagering requirements, unless explicitly stated otherwise in the relevant supplemental Terms and Conditions. Please see in the table below for game weight distributions for all wagering purposes. Please also see term 23 for bet staking requirements. Currency rates for wagering purposes will be calculated as 1 GBP = 1 EUR = 1 USD = 1 CHF = 1 AUD = 1 NZD = 10 SEK = 10 NOK. BE ADVISED that your allocated funds are wagered first; once fully wagered, you will start wagering on your promotional bonus. The Wagering Requirements for any Additional Bonus (i.e. Refund, Prize, Extra reward/Bonus, Cashback, bonus back, tournament winnings and race winnings) are as follows - You must wager an amount equal to thirty (30) times the additional Bonus awarded to you, unless stated otherwise in the supplemental Terms and Conditions. The Wagering Requirements on After-wager Bonuses are as follows - You must wager an amount equal to Fifty (50) times your Deposit amount unless stated otherwise in the supplemental Terms and Conditions. Once wagering Requirements are complete you will receive the bonus funds into your main wallet as cash. For free play bonuses that do not require a deposit for their acquisition (i.e. Registration Bonuses, Extra Spins, extra spins and Free Bonuses), note that no winnings may be withdrawn until you have deposited at least £10 into your account. In addition, no winnings accrued in connection with any Free Bonus may be withdrawn and/or transferred until the wagering requirement has been met. The maximum winnings that will be paid out from any free bonus (including Extra and/or extra spins) is £100. Winnings in excess of this amount will be removed at the point of withdrawal. Unused winnings for a period of 30 days or more will be considered void and removed from the account. The Wagering Requirement for Free and Registration bonuses is thirty (30) times the Bonus amount, unless stated otherwise in the supplemental Terms and Conditions. Ladbrokes Casino reserve the right to review transaction records and logs from time to time, for any reason whatsoever. If, upon such a review, it appears that a customer is participating in strategies that Ladbrokes management, in its sole discretion deems to be abusive, Ladbrokes reserves the right to revoke the entitlement of such a customer to any promotion. All withdrawals will be subject to an internal audit before being processed. Ladbrokes reserves all rights to void Bonuses or any winnings for failed audits. Player hereby consents in advance to same. If, upon such a review, it appears that a Player(s) are participating in strategies, taking advantage of any software or system bug or failure, or participating in any form of activity that Ladbrokes, in its sole and complete discretion, deems to be abusive ('Promotion Abuse'), Ladbrokes reserves the right to revoke the entitlement of such a Player to receive or benefit from the promotion (and/or withhold the pay out of the proceeds of such abuse to the Player/s in question). Only fully settled bets (i.e. bets that result in a win or loss) will be counted towards wagering. 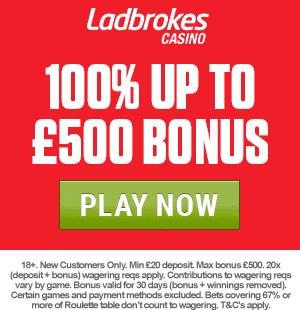 for the duration of any "New Player Bonus" (meaning all registration bonuses, first deposit bonuses, second deposit bonuses, third deposit bonuses and/or equivalent offers provided to new registrants when opening an account with Ladbrokes Casino), place bets in any single bet or game round which is greater than 30% of the bonus amount or higher than £50 or currency equivalent, calculated in accordance with the rates set out in section 12 of these General Terms and Conditions. and Ladbrokes reserves the right to void any bonus and all associated winnings where a customer fails to observe these limits. If a Player, acting alone or as part of a group, registers multiple accounts in order to claim the free bonus offers. All winnings in any account/s belonging to such customer will be withheld and any pending bonuses will be voided. Abusing customer accounts may be terminated immediately. Customers found to be abusing promotions may be barred from receiving further promotional offers. Ladbrokes has the right to refuse or void a bonus or winnings in the event of funds being cancelled or denied by any payment service or payment provider. Ladbrokes is aware that some free bonus links may be posted on other sites or through forums or the information that the potential customer received may have been forwarded on to other persons who didn't receive the genuine bonus offer. If Ladbrokes determines that a specific customer did NOT receive that particular promotion as an intended exclusive targeted recipient that this promotion was sent out to, we will not honour any payout requests from the customer, even if they have met the wagering criteria. In the event of any dispute, the decision of Ladbrokes will be final. Ladbrokes management reserves the right to change or end any promotional offer at any time and without further notice. If, while playing at Ladbrokes Casino, you win a sum regarded by Ladbrokes Management as worthy of publicity, you agree to make yourself available for any event of such nature arranged by Ladbrokes. While Ladbrokes protects all personal data entrusted to us, we reserve the right to use first names and the first initial of the last name in any Ladbrokes announcement about promotion results or on the website or lobby. In order for us to process your withdrawal, for security we need to verify your identity. You only need to send your identifying documents to us once and it's advised to send your identifying documents before you plan to cash-out, in order to ensure a smooth and fast withdrawal process. Once the documents (in an acceptable format and detail) have been received by us it can take up to 5 business days to process them and once they have been processed you can make withdrawals from your Ladbrokes account (note that this process is a one-time process). For withdrawal we require the following documents for verification: One government approved identity card (ID card, passport and driver's license) with a picture, as well as proof of residency such as a utility bill (which is not older than 2 months) and an Authorization form duly completed. If your deposit method was via a credit card we will require a scanned copy of the credit card (front and back) which you used. Please note that occasionally we may need to ask, at your sole cost, for additional documentation such as confirmation of deposits, a bank reference or notarized identifying document. Ladbrokes Full Terms & Conditions also apply. When you first sign up at Ladbrokes, you'll automatically be given the option to claim one of the bonuses above. Our advice is not to do so straight away, but wait and contact Customer Support. Customer Support advisors have the freedom to offer 'under-the-shelf' bonuses which can be customised for each player. Play 'hard ball' a little and keep refusing the offers until you get to a point where you've got maybe an extra 20% on the original offer. It doesn't work every time, but it's always worth a try!